This was the 3rd year we have been. As like the previous years great value for money, looking forward to going back. It was a lovely day made to feel very welcome. We were a little late arriving but that was not a problem as we were given the option of going out at a later time. The course is well maintained. Part of our deal was soup and a roll which was excellent. My friends and I lapped up the scenary, the sun and some challenging par 3s, a great deal indeed. Think we saw Callander GC at close to its best,lovely weather, a good test of golf and a great deal for 2 rounds. Only disappointment was the greens were affected by work so putting a lottery. Would be happy to return when conditions improved. Enjoyed the day. The staff looked after us well. Food was good. As mentioned above greens were not good. Rest of course was good. Just a wee thank you for yesterday, everyone enjoyed it even though the weather wasn’t the best. We were made very welcome and everybody was more than friendly. Just a wee thank you for yesterday, everyone enjoyed it even though the weather wasn’t the best. We were made very welcome and everybody was more than friendly. Dear Members and Staff of Callander Golf Club. On behalf of myself, Mirren, my Assistant Competition Manager, Steven the Rules Official and Annie our Scores Recorder, I would like to sincerely thank all of you for your hospitality and patience with us over the 10th / 11th of August. I can say without a shadow of a doubt, that the welcome and assistance we received from everyone involved with Callander Golf Club, from our initial meeting through to the conclusion of the competition, has surpassed anything we are used to in Special Olympics. Evelyn, Ashley and Lorna could have done no more in helping us with the organisation within the clubhouse – to tee times and local knowledge about where best to place certain tees for our 10 Hole players. I normally have to field complaints from coaches and parents saying that the course is either too hard, too easy not long enough or too long for their players. This time – not one complaint. Quite the opposite. I have had many e mails from Head Coaches with nothing but compliments about the course, how it was set up and how much their players had enjoyed tackling it. Our Level 1 (beginner golfers) had an absolute ball at the practice facility initially and to top it off, they had their putting competition on the practice green in front of the clubhouse – their parents and club members. That is an experience that they will always remember. In conclusion – Thank You All for making the Special Olympics 40th Anniversary Golf Competition one of the most enjoyable and memorable that I have had the privilege of being involved with. Just a quick note to thank you all very much for your help and assistance last Friday and Saturday. All the players really enjoyed your course and the surroundings. Delighted to say my son won Gold in Div 1 with scores off 60 + 63. Thanks again and I hope to manage up sometime and play myself. Great day out. Welcoming staff and quiet course. Really good day. Had 2 rounds of golf and the rolls on bacon were so tasty we had more after the second round. Very friendly reception and ecellent course. Have been before and this was just as good as previously. Lady in the pro shop was very friendly and helpful. On arrival at Callander Golf club we received a very warm welcome in the pro shop. The facilities were spotlessly clean and spacious. The course itself offered a great mix of long and short holes which suited the mixed abilities of our foursome. The course is very picturesque with stunning views of Ben Ledi As with most courses this year, the dry hot weather has taken its toll on a few areas of the course but on the whole the grass has endured the heat well. Nice course, nice welcome ,nice food and even nice weather. Perfect ! Just home after a round at Callander Golf Club this morning. It’s a 50 mile round trip for us but well worth the travel and we will definitely play it again. Like most courses in the area, the greens have suffered through this extended dry spell but you won't catch a Glaswegian complaining about the sunny weather. If you are looking for a challenging course, stunning scenery, a nice bite to eat and a friendly welcome, give it a try - Well worth a visit. Nice course, nice welcome ,nice food and even nice weather.Perfect ! Have been before and this was just as good as prevbiously. Lady in the pro shop was very friendly and hrlpful. Ian MacLeod - Just a thank you from the 4 of us for a really great day at Callander yesterday. Everything went like clockwork and the staff could not have been more friendly and helpful. Super little course, greens suffering at the moment but views more than make up for it. Despite its short length tight fairways and small greens make it a test of golf. Holes from the Avenue provide fantastic views of Ben Ledi. Food very good and club house atmosphere welcoming. Super day out. Thank you - Callander Golf Club. As per usual Callander golf club delivers. I would say the course is needing a wee bit work done but it’s still a great wee course. Scenery is fantastic. Staff are nice and friendly and make sure you’re well catered for. All in all a great experience. Really good, well set out golf course. Great day out in a smashing area of the country, will certainly be returning. You can’t beat a great price and deal from itison, thanks. The staff were extremely helpful. A great friendly clubhouse and a lovely wee course. I have already played the course several times and wouldn't hesitate about returning. Lovely, friendly wee golf club. 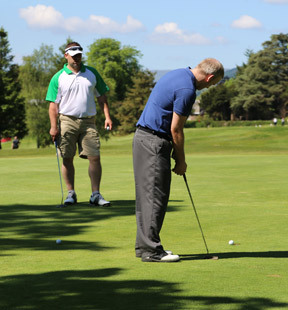 The course was in great condition and everyone we met was very helpful and friendly. We had a great day out and will be back. Nice day out in a lovely setting. Very picturesque course. Pity about some of the greens which have obviously suffered over the winter. The staff work hard and do their best. The staff in the shop and clubhouse were very helpful and friendly. We enjoyed a nice lunch after our game. Smashing! Lovely people at and on the course. Efficient handling of booking and tee time. Especially enjoyed holes 15, 16, 17, 18 for the golf and the views. Easily value for money. Unfortunately, the course was in poor condition. Lots of wet areas and most of the greens were very bumpy and had sandy patches which I was not expecting. I know the weather has been very wet but did think it would be better than it was. This was meant to be a great day out with my son and two friends to celebrate him leaving for a year abroad at University. So disappointed. Course in good condition despite the weather. Staff friendly from start to finish. We will be back, great day out. They could do with more buggies, other than that I could not fault them. Thoroughly enjoyable days golf on a great course. Staff were very friendly with great service. Only one small thing - maybe kitchen could be open earlier to provide hot rolls. The welcome and the arrangements were great. Very welcoming club and a good deal. Shame it rained all day so saw none of the famous views. Course suffering from all the rain. Greens very good despite the deluge. Staff were lovely and helpful! Staff lovely! Course needs a bit of attention! Very nice day, Golf and hospitality 1st class.